The Clinton County Bulldogs moved to 3-0 this season with the Friday night rout over the Bobcats of Pickett County, Tennessee, 50-18. Even though Pickett County scored more points against the Dawgs than any of the other two opponents combined, Head Coach Jamie Miller said a couple of Byrdstown’s touchdowns were gimmes. Miller said he was a little worried at the beginning of the game that his team wasn’t ready to play. One of the best things for Miller is the fact Pickett County is so close, a long bus ride isn’t a factor. This Friday night Clinton County will host Caverna at 7 p.m.
Friday night will also be Veterans Night where any veteran who wants to be recognized during halftime will be saluted. 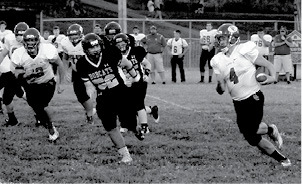 Noah Pruitt drove the ball down the field Friday night against Pickett County. Clinton County moved to 3-0 on the year with the 50-18 win.